The truck, which is in the popular 6×2 tractor cab format, will be trialled by the firm – an LNG supplier itself – with a view to introducing more gas-powered trucks to its fleet. David Brown, Calor’s fleet asset manager, said: “We believe LNG can help hauliers improve their operational efficiency, delivering a lower cost fuel to diesel with good availability. 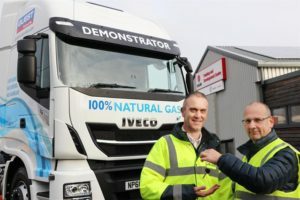 The IVECO Stralis NP (Natural Power) LNG 460BHP 6×2 tractor has only recently gone into production, and Guest Truck and Van is the first UK dealer to offer the model as a demonstrator.